Now more than ever people are turning to the Internet for products and services they want to buy locally. Recent research from ComScore reveals that 66% of Americans use online search to locate local businesses and services, and 61% of local searches result in purchases either on or offline. Even at casual glance such numbers scream the importance of local search to small business owners, and Utah-based OrangeSoda has seen success helping small companies fully harness the power of the communication channel. Specifically, OrangeSoda provides a search engine marketing platform designed to help small to medium sized businesses increase visibility locally through geo-targeted online marketing. The company takes a more holistic approach to search marketing than most, managing paid listings, organic results, and local business listings at the top of results pages (often referred to as the Google 10-pack). The latter offering, officially announced today, constitutes the company’s most recent addition to its service package. Local SEO is a whole different ball game than traditional SEO. Client budgets are smaller, making it crucial for service providers to have a strategy that works the first time rather than relying on a drawn out trial and error process. It is also vital that service providers discover methods for generating conversions with individual keywords that often don’t have massive search volume. Two notable players in the local space are Yodle and ReachLocal, who focus primarily of paid search optimization. Though a slightly more precise science than large scale search marketing and SEO, local search optimization is still an emerging craft. However, there is conceivably greater potential in the local sphere, as searching with a local identifier more directly reveals intentions of making a purchase. The space has received considerable funding, with Yodle and ReachLocal sitting on approximately $65 and $25 million respectively. 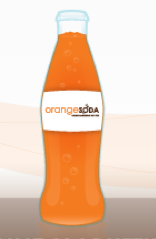 OrangeSoda has brought in a total of $7.5 million since its founding in 2006. It will be interesting to see how the space shapes out, and if more comprehensive services like OrangeSoda’s can compete with those focusing on specific facets of local search.